Fig. 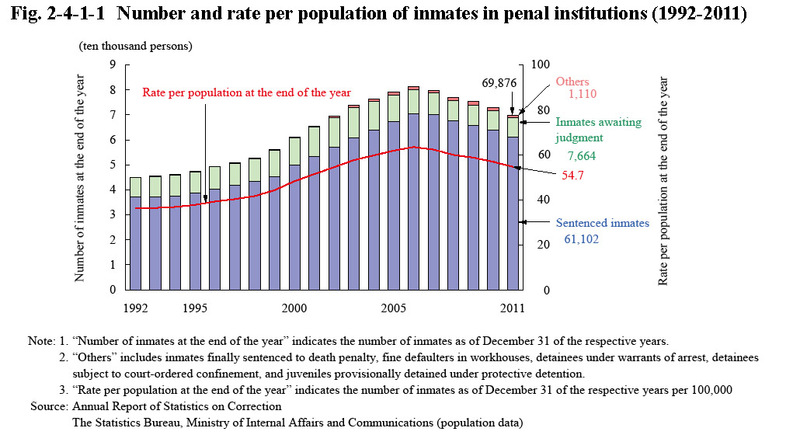 2-4-1-1 shows the number and rate per population of inmates in penal institutions as of the end of the respective years over the last 20 years (See Appendix 2-5 for the average daily number of inmates). The number of inmates as of the end of the respective years continued to increase every year from 1993, reaching the record high level since 1956 of 81,255 in 2006, but then started decreasing in 2007, and was 69,876 as of the end of 2011 (including 978 fine defaulters in workhouses; down 4.2% from the previous year).